Angina, commonly known as chest pain, is not uncommon after ingesting caffeine, mainly due to caffeine’s role as a stimulant. It raises blood pressure and makes the heart pump faster and stronger for a short time after the caffeine is absorbed by the body. In most cases, this is a temporary effect without long term concerns. In some people, particularly those who already have abnormal heart rhythms, large amounts of caffeine can provoke a “skipped beat” or rapid heart rate. For most, however, their likelihood of experiencing any cardiovascular effects depends on how much caffeine they drink normally. Those who enjoy caffeine regularly develop a tolerance for its effects. In habitual coffee drinkers, the sudden appearance of chest pain or a rapid heartbeat are likely unrelated to caffeine intake. Caffeine is a stimulant known scientifically as 1, 3, 7-trimethylxanthine. Due to the global popularity of caffeine-containing foods like coffee, tea, soda, and chocolate, caffeine is the most widely-used psychoactive substance in the world. Caffeine is also addictive and a dependency can form if you ingest the equivalent of around three to four cups per day for several weeks. Due to how it provokes the body, caffeine is employed in a wide number of different pharmaceutical and diet products. Numerous drugs make use of caffeine to speed up how quickly their contents are absorbed and take effect within the body. Diet pills sometimes employ caffeine to give a temporary boost to the body’s metabolism. Assuming a regular-sized dose, caffeine takes around 30-45 minutes to be fully absorbed by the body. The effects of caffeine tend to fade after three hours at most, at which point it is excreted. Due to how prevalent caffeine is, it is natural to wonder if it is possible to overdose on the substance. The short answer is “no” and the long answer is “yes, but”. For adults, it takes about 10 grams of caffeine to make a fatal dose. This is the equivalent of drinking 80-100 cups of coffee. Since caffeine does not accumulate in the body, these drinks would have to happen in relatively short succession. There are a series of known incidents where people have died from caffeine overdoses, but all of them have been from either overdosing on caffeine pills and powder or by ingesting multiple energy drinks within a short period. When energy drinks were consumed, it was usually in the range of six to eight cans. The exception to this is with teenagers, where as little as two or three cans of energy drinks per day could provoke an overdose reaction. Naturally, the risk is heightened if a preexisting heart condition is present. For most people, the worst they will experience is chest pain, insomnia, an increased need to urinate, and gastrointestinal discomfort. These symptoms tend to appear only if someone goes over the amount of caffeine that their body is used to. Unless you have a preexisting condition or are taking caffeine pills or energy drinks, it is not likely that you will experience heart complications beyond short term chest pain or palpitations. There have been an extensive number of studies about how coffee and caffeine interacts with the heart and the results have been mixed, to say the least. What consistency that exists suggests that caffeine doesn’t cause heart disease, but there are also plenty of studies saying the exact opposite. If you find that you from suffer chest pain, insomnia, or any other undesired symptoms from caffeine, the best solution is to cut back or stop consuming it altogether. As mentioned earlier, caffeine is not retained by the body so stopping consumption is guaranteed to relieve your symptoms. However, as caffeine can be addictive, going cold turkey can sometimes provoke withdrawal if you ingest it regularly. In this case, moderation and slowly reducing the amount of caffeine you ingest will be a better option. Non-cola soda: Dark sodas like “Coke” and “Pepsi” are known to contain caffeine, but so can others. One can of orange soda can have up to 41 milligrams of caffeine, and some cream sodas have 25 milligrams. 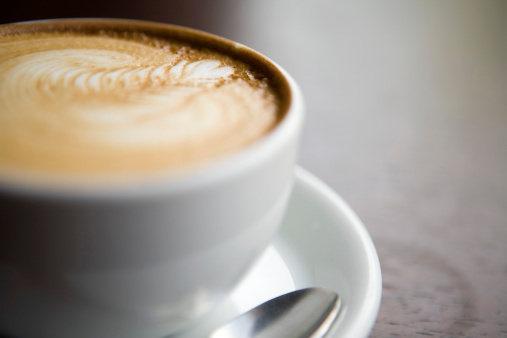 Decaffeinated coffee: Surprisingly, some decaf coffees—especially the ones you get from baristas—can contain caffeine. The amount is usually much less than a normal cup, but in some instances can be as high as 20 milligrams. Whether the not-quite-decaf coffee is due to cross contamination in the machine or the type of coffee powder used would depend on the location. Pain medicine: As mentioned, some drugs make use of caffeine to improve how fast they are absorbed by the body. Pain relievers are one such example of this. One pair of Excedrin migraine tablets—the recommended dose—contains 130 milligrams of caffeine. The exact amount of caffeine a drug contains varies depending on the brand in question, but you should be careful to check the ingredients nonetheless. Klein, S., “12 Surprising Sources of Caffeine,” Fox News Magazine web site, July 5, 2012; http://magazine.foxnews.com/food-wellness/12-surprising-sources-caffeine. “Documented Deaths By Caffeine,” Caffeine Informer web site, http://www.caffeineinformer.com/a-real-life-death-by-caffeine, last accessed October 22, 2015. Kovacs, B., “Caffeine: Read About Side Effects, Addiction, and Withdrawal,” MedicineNet web site, http://www.medicinenet.com/caffeine/article.htm#caffeine_facts, last accessed October 22, 2015. Marks, D., “Can Caffeine Cause Chest Pains?” Livestrong.com, August 16, 2013; http://www.livestrong.com/article/537796-can-caffeine-cause-chest-pains/.